It gives me great pleasure to be here today in honour of the Diocesan Boys' School (DBS) and its 150th anniversary. 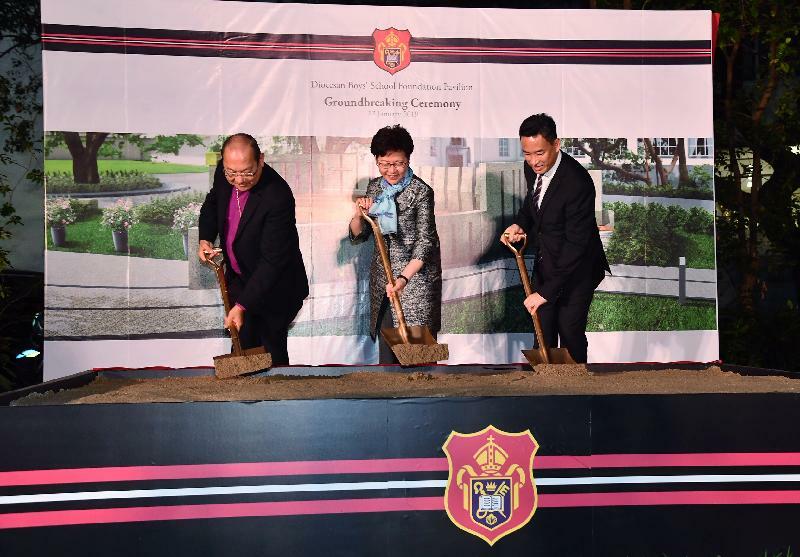 Incidentally, I attended my alma mater St Frances' Canossian College's also 150th anniversary celebrations last month. This reminds me that Hong Kong is so very blessed by having these very fine, well-established schools, whether they are Catholic or Anglican, girls or boys schools. They have given Hong Kong the talents that have brought our City to where she is today. 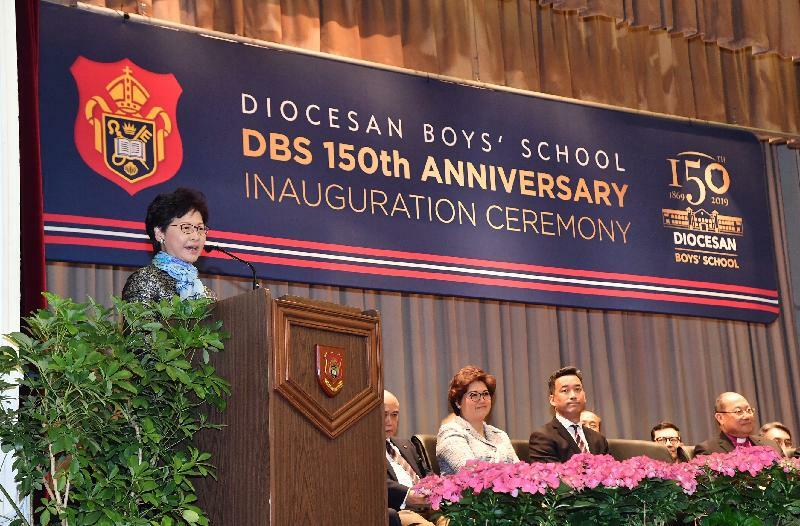 Over the past century and a half, DBS has been educating Hong Kong youth, instilling in them an abiding love of learning, strength of character and spiritual guidance. Hong Kong is much the better, much the richer, thanks to this school. A few of you may remember, and Headmaster Cheng has just reminded you all, the last time I spoke here. It was April 2009, almost a decade ago. I was then, in my capacity as Secretary for Development, taking part in a Tree Planting Day, signifying perhaps that while it takes a decade to grow a tree, it requires a century to nurture talents, in a holistic way. It was, I remember, a rainy day with an amber rainstorm signal. Still, the torrential rain did not deter us from planting a bauhinia tree at the side of the sports field. I'm told that the tree that we planted is now some five metres in height and already yielding the brilliant blossoms that are a hallmark of the tree. In good time, it will continue to grow and mature, providing shade and serenity for all of us who turn to it. DBS's beginnings were similarly modest, a simple cement structure planted in a rice paddy field. But blessed with abundant time and faithful nurturing, the School has flourished. Over the years and the decades, thanks to visionary management, dedicated staff and supportive parents, the School has graduated generation upon generation of students. They, in turn, have become illustrious alumni, splendidly serving both the school and Hong Kong, including serveral former and current members of the Legislative Council, my senior civil service colleagues and many others. Today, DBS continues to pursue academic excellence. No less important, it places equal emphasis on imparting such essential values as integrity and industriousness, discipline, devotion and gratitude. The School, I'm pleased to add, embraces whole-person education, providing its students with wide-ranging opportunities in sports, music, arts, as well as a social services programme and much more. My Government believes in whole-person education. Education must do more than transfer of knowledge or skills. It has to give our young people broad-based abilities and the essential adaptability to pursue fulfilling careers, and lives, and uninhibited creativity to envision the future. Since taking office in July 2017, quality education is placed very high on my Government's agenda. Apart from injecting new resources into education, to the tune of $8.3 billion recurrent expenditure by now, task forces led by professionals have been established to look at various aspects of our education system. One task force is assisting the Government in refining the school curriculum at both the primary and secondary levels. Meanwhile, we are doing everything possible to ease stress among students, to engage their creativity and curiosity and to instill in them a love for life-long learning. In the coming school year, in response to the aspirations of teachers, we will implement an all-graduate teaching force policy in one go in public-sector primary and secondary schools. The point, of course, is to attract and retain talented teachers – professionals who can make a difference. A recurrent Life-wide Learning Grant will also be provided to encourage public-sector schools to organise more out-of-classroom, experiential-learning activities. DBS and other Direct Subsidy Scheme schools will benefit from these new initiatives through a unit subsidy. I have no doubt that you will make optimum use of the new resources, and the opportunities they offer the School and your students. 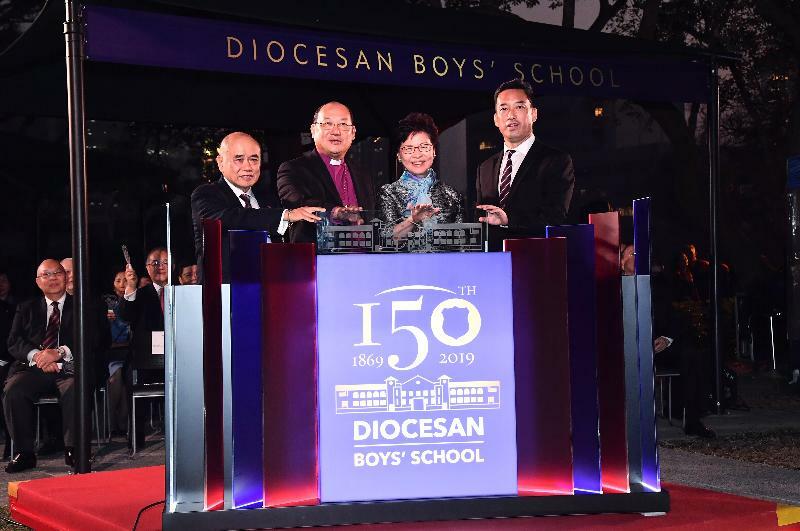 Again, my congratulations to Diocesan Boys’ School, the School Committee, the principal and teachers for your dedicated work, for continuing a tradition of quality education that now spans 150 remarkable years. I wish the School and every one of you here all the best in the years ahead. Thank you very much.